Good morning. As I promised yesterday, I am going to show you another sample I did for Sheena Douglass. Don't forget Sheena is on Craft Clinic tomorrow at 11am, on Create and Craft with the new Primary Elements from Luminarte. Again, I have done a bright card. I used the Primary Elements to make the background of the stamped image. I mixed the three colours individually into a paint and then using a sponge, I dabbed them onto the back of centura pearl to create this background. Unfortunately the photo does not show how sparkly it is. 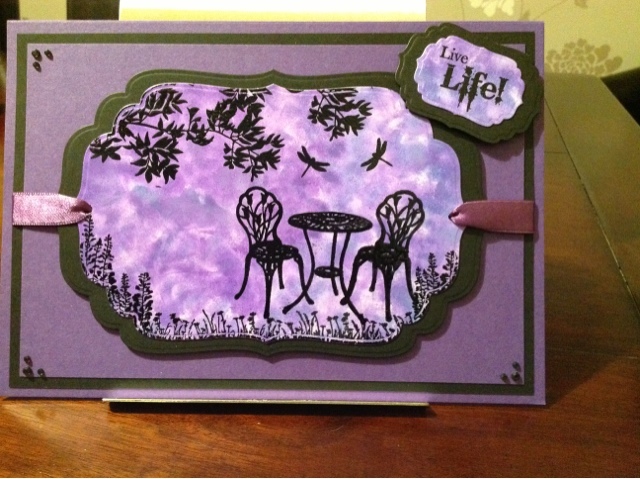 I then die cut the painted background twice and using the Silhouette Garden stamps I stamped the images using Versamark, and then embossed with WOW black embossing powder. Then I used card, ribbon and gems from my stash to create this bright, but moody card. Please stop by again and I hope you all have a great Sunday. Love the card, especially the colour palette. Will have to tape the shows and look forward to seeing more of your lovely creations. WOW this is stunning!!! I love the background you have created and the gorgeous stamp set. Great colour combination too. Linda you are very kind. Thank you very much. This one was my hubby's favourite.